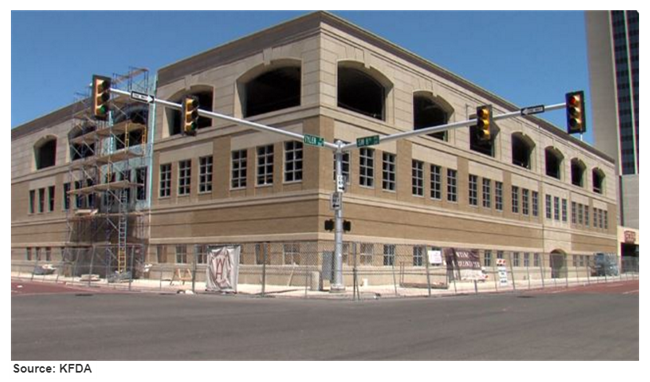 ​​AMARILLO – Construction for phase one of the new West Texas A&M (WTAMU) center in downtown Amarillo is almost complete. The new building will help the university not only expand its services but also accommodate both students and residents. Phase one focuses on remodeling the exterior of the former commerce building. The 100,000-sf area will allow the university to keep courses in one area unlike its current 50,000-sf area. The bigger space will also allow WTAMU to offer more programs in Amarillo, which includes instructional and technology program. The Special Education department will be permanently moving into the new center along with the Counseling department and the Communication Disorder department. The expectations are to move into the center by summer 2018 and have students walking down the halls by fall 2018. Phase two of this project should begin within the next couple of weeks.